2019 is already shaping up to be the year of the temper tantrum in golf. Earlier this month, a very frustrated Sergio Garcia was caught on tape damaging multiple greens at the Saudi International. The Spaniard’s outbursts were deemed to breach golf’s new serious misconduct rule and he was subsequently disqualified from the tournament. Last week at the WGC-Mexico, we saw yet another green-damaging tantrum—only this one occurred off the course after play had concluded. Following a four-over 75 in his opening round in which he ranked 71st of 72 players in strokes gained with his putter, Bryson DeChambeau spent the remainder of his day and night trying to hone his flat-stick game on Chapultepec’s practice green. As you can see in the background of this Rich Beem interview for SkySports, it wasn’t going very well out there for the Mad Scientist at first. Bryson stuck with it well into the night, however, repeating his stroke over and over in the dark while his team illuminated his immediate surroundings with flashlights. And before teeing off on Friday, the Californian issued the following apology to his fans, fellow players and the grounds crew at Chapultepec for his behaviour the previous evening. If this were an isolated incident, it would be easily dismissible. But these “passionate” outbursts are becoming a trend for DeChambeau and it’s starting to get a little problematic. Here’s DeChambeau at Riviera one week ago, carving up turf on the edge of a greenside bunker in a fit of rage. And let’s not forget the meltdown he had on the range at Carnoustie last summer after a disappointing start to the tournament. 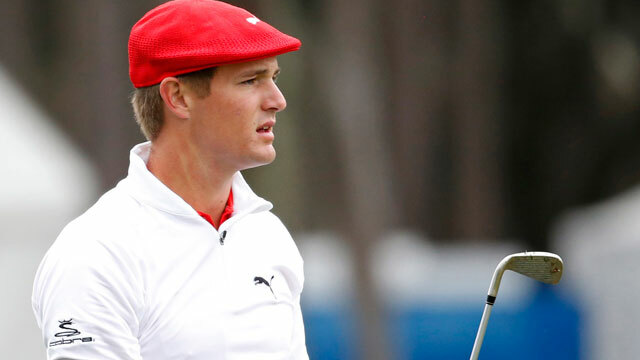 These tantrums are starting to become as distinctive a DeChambeau trait as his unconventional, scientific approach to the game, and that is neither a good look for one of the game’s rising superstars nor the sport in general. LPGA Tour fans were in an uproar about the integrity on the LPGA Tour on Friday after a “back-stopping” incident occurred at the Honda LPGA Thailand. On the 18th hole, Ariya Jutanugarn and Amy Olson had similar-length pitches from just off the green. Jutanugarn, who had the much easier shot of the two, went first and hit a brilliant shot to just a few feet from the pin. On her way to mark her ball, however, the World No. 1 motioned to Olson and then stopped abruptly to allow the American to hit her delicate shot off a downhill lie. Olson didn’t catch it quite right and her ball would have finished 20 feet or so away from the cup had it not struck Jutanugarn’s and come to a complete stop less than two feet from the hole. After the shot, the two players smiled at one another, bumped fists and claimed their birdies, leaving those watching in person and at home to wonder what the heck they had just witnessed. Things added up quickly for Rickie Fowler in his second round on Friday when he shanked his second shot of the day right out of bounds. Things only got worse from there as he dropped the ball for his fourth shot from shoulder height instead of knee height, as golf’s new rules stipulate. That snafu cost Fowler another stroke and even though he put his next shot on the green and needed only two putts, he still walked off the hole with a 7. Rory McIlroy nearly made a hole-in-one on a par 4 at Chapultepec on Thursday with a 2-iron. That’s right, a 2-iron! Granted, all 7,000+ feet of elevation helped the Northern Irishman propel his iron strike 307 yards, but it still looked super cool. Not to be outdone, Tiger Woods pulled off quite the spectacular shot of his own on Friday. Stuck behind a large tree in a fairway bunker, Tiger hit a vintage cut shot and abbreviated follow through that sent his ball boomeranging around the tree and spinning violently towards the cup once it landed on the green. He kept his ball, saved the drop and smiled afterward. That, folks, is how you duff a shot in style!